While I love to get dressed up for date night (I'm talking hair, makeup, dress, heels, statement jewelry...the whole nine yards), there is also something so refreshing about a casual look for a night out with Garrett. Casual dressy is great because you never have to worry about looking like you are trying to hard (which is so easy to do if you aren't careful). I love to envision myself going out to a super fancy restaurant wearing something super fancy...but lets face it. Not all Valentines Day dates require formal dresses. So if you are planning on heading to a restaurant with a more casual vibe, or having a night out with your girlfriends for Valentines, here are a few tips for keeping your look festive but casual for the 14th. Many times you can feel a little too over dressed in a skirt or dress, but you are almost always safe in a great pair of jeans. They are easy to dress up or down, even with some distressing. These jeans are my absolute favorite pair to wear right now. Just ask my kids...they see me wear them everyday. Just enough distressing right at the knee (making it easy to kneel down and play with my kids without making the holes bigger). Worth every penny! A silk blouse or lace top might be what you would expect to see on Valentines, but I love this embroidered sweatshirt as an option! 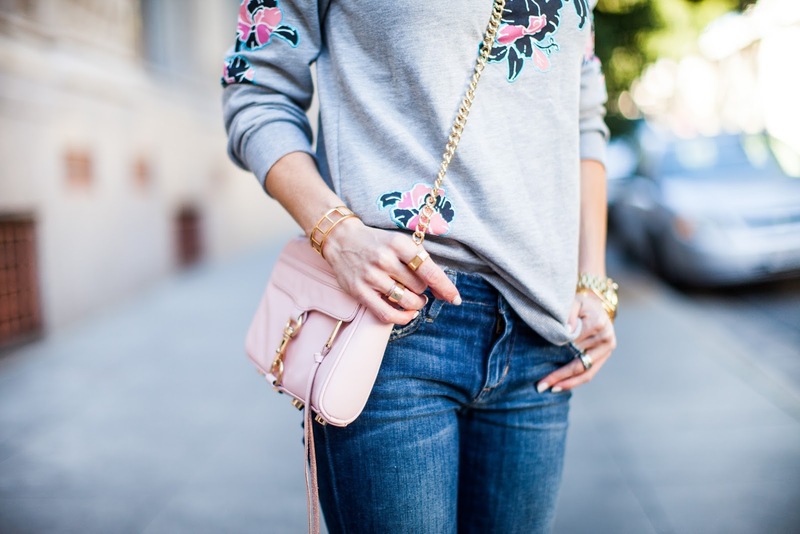 It has a pop of pink and beautiful detailing, but the sweatshirt keeps it cool and understated. The right heels and bag kick the look up just enough to justify date night worthy. Also, I just wanted to thank you all so much for your excitement and kind words about the launch of my new Youtube channel! It has been so much fun reading all of your ideas and requests for videos and I can't wait to show you what I have in store. Make sure you head over and subscribe to my channel for a chance to win a $100 Nordstrom gift card!